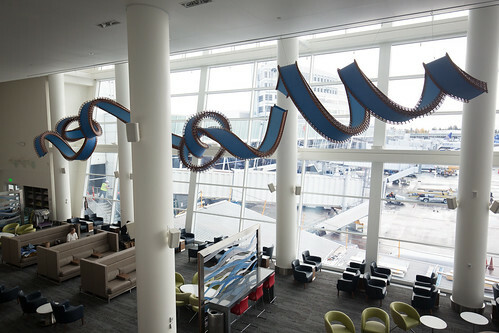 SEATTLE - Views of Mount Rainier greet guests at the new Delta Sky Club in Seattle-Tacoma International Airport, where the airline has added a second club to meet growing travel demand at its Pacific Northwest hub. Construction began in late 2015, and the 21,000-square-foot lounge, which opens Friday, stands as one of Delta’s five largest clubs. With exceptional views of the runway and the mountain range, it creates a relaxing environment to touch down between flights. This opening follows the Atlanta B flagship club opening last month. For more than two years, the airline has invested in Delta Sky Clubs, making them another reason to choose Delta. Seattle’s Club represents the newest in renewed thinking behind the airline’s guest experience and features local touches designed to provide a meaningful, inviting environment for members and guests, from modern décor seating to locally inspired art, premium drink offerings and a first-of-its-kind, in-club spa. Conveniently located beyond airport security between Concourses A and B, the new club seats more than 400 customers on two levels. In addition to chef crafted items, guests can enjoy a buffet including bagels, hard-boiled eggs and yogurt for breakfast, as well as soups, salads, veggies, crackers, dips, fruit and snacks throughout the day. THE BAR at Delta Sky Club offers a variety of premium and complimentary options including Washington wines curated by Master Sommelier Andrea Robinson, cocktails from local distilleries, Georgetown Lucille IPA craft beer, a self-serve espresso machine and freshly brewed Starbucks coffee. The club’s interior pays homage to the Pacific Northwest with a heavy focus on wood, water and movement. The lounge features 30-foot ceilings with curved paneling and a mezzanine level with an art gallery showcasing work from emerging artists and local galleries. It will feature contemporary furniture with power outlets near every seat. Six shower suites will be a welcome feature for travelers transitioning between international flights. This new Delta Sky Club location represents the airline’s continued investment to serving the growing customer base in the Pacific Northwest. Delta is the largest global carrier at Sea-Tac and has more than tripled flights and destinations at its Seattle hub since 2012. Delta offers 127 peak-day departures to 36 destinations from Seattle, and every Delta flight from Seattle features jet service with Delta One/First Class and Delta Comfort+ seating. Delta people are active members of the community, giving their time and resources to more than 100 organizations close to the hearts of Seattleites, including Habitat for Humanity of King County, Boys & Girls Club of King County, PATH, KaBOOM!, Seattle Pride and End AIDS Walk Seattle, among others. In 2016, Delta paid out more than $53 million in profit sharing to its Seattle employees and committed to contributing 1 percent of its net income from the previous year to key charitable organizations, including organizations in Seattle. The airline’s expansion at Sea-Tac is estimated to contribute $571 million annually in total economic output.